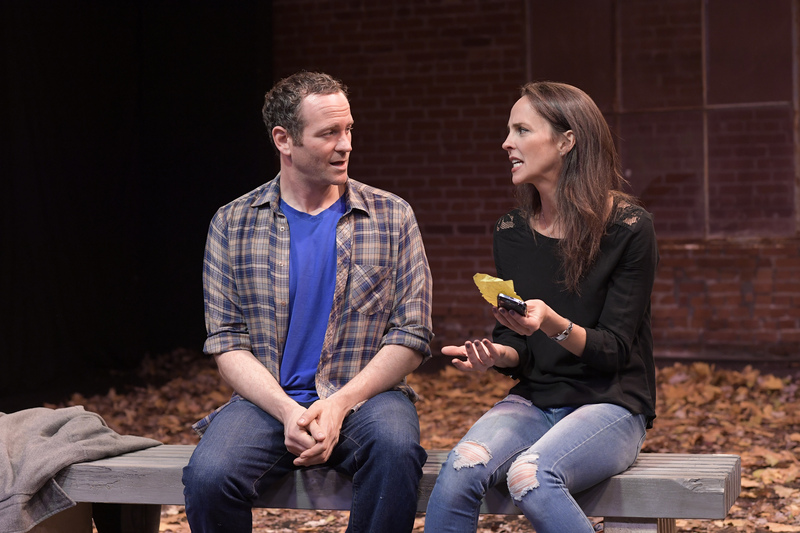 Wes Berger as Bobby (left) and Sarah Murphy-Dyson as Tina (right) star in the Canadian Rep Theatre presentation of The Damage Done. One day soon we highly suspect George F. Walker is going to treat us all to an uplifting musical. You know the kind—no guns or villains, just endless hugs and optimism. Until then, he wants you to wade into the world of unknowns. Including why a man and woman have made the decision to meet in a park. But the storytelling craftsman doesn’t leave you hanging to long. And if you ever felt that moment in life like there was no way forward and only a hopeless way back, you’ll find a suitable landing pad with Bobby (Wes Berger) and Tina (Sarah Murphy-Dyson). A duo that’s been to hell and back for one another, they find themselves in a familiar place in tugging and tearing at their souls. The human denominator being that at least the shared parents are attempting to support one another. In this hard knock life triology, playgoers first met them in Walker’s East End Canon in TOUGH! and then again Moss Park. In the latest instillation, The Damage Done, it’s a time for the lost souls to take a long hard look at their lives not to see if there’s anything worth salvaging but rather to see how to carry on. If there was a time when plays didn’t sound like TV, those days are long gone. Walker gives voices to real people with real problems and doesn’t rely on medium limitations to convey those ideas. These are rarely comfortable places with any sign of pleasantries on the horizon for anyone involved yet there’s so much to absorb. However the material is in the very capable hands of director Ken Gass who knows how to peel back the layers to dig right into the thematic core for actor Tina’s unexpected exodus and her request for musician / explorer-turned-playwright Bobby to play a greater role in fatherhooding. You need not have experienced the previous two offerings to follow this dramatic two-hander easily. The angry and desperate are good company no matter what stage in life you catch up with them.